Orderhive’s Order Management Software brings all of your orders tracking in one location to process them from start to finish means cutting down upon manual and time-killing mistakes. Eliminate every chance of manual inefficiencies with end-to-end process automation. One interface for multi-channel orders dramatically reduces time and costs involved in a number of administrative and order processing tasks. With all orders in one place, you can perform bulk action and avoid repetitive tasks. 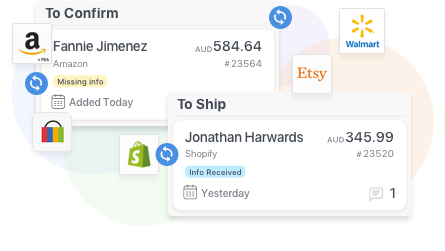 Seamless synchronization with sales channels and shipping partners lets you process orders as soon as you receive them. With Orderhive’s most real-time order tracking get immediate order and shipment updates for you and your buyers. 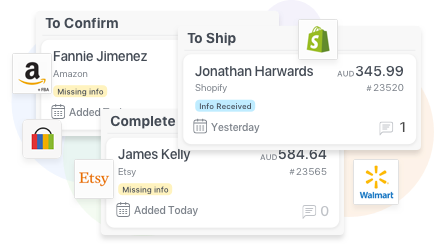 You or your team doesn’t need to log in to multiple systems or websites to keep track of and process your orders anymore. Improved team collaboration means improved fulfillment and better results. Bring all your order into a single dashboard. Treat your orders the way you want. OS platforms that are supported by Orderhive? Orderhive order management software supports all of the most-used OS like Windows, Mac OS, and Ubuntu. What type of order information is fetched by Orderhive? Orderhive’s order management software fetches basic order information such as Bill-to, ship-to, item-details, order total, discounts, and extra items if any. You can also add 5 types of custom fields to save any additional information to your orders. Will my clients be able to track their orders? Orderhive order management software is integrated with 300+ shipping carriers. 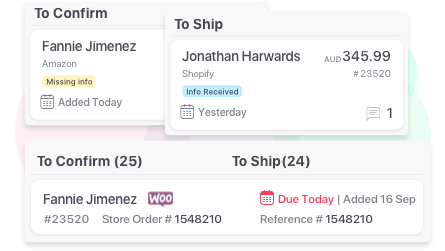 Once you ship an order using Orderhive, you can send automated or direct emails to your customers. 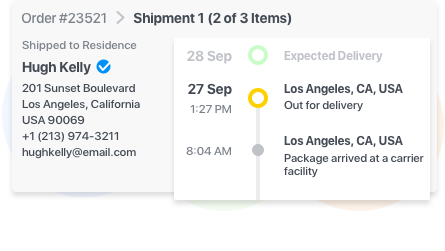 Also, customers can track their orders through the shipment tracking IDs provided by you, your channel or the shipping provider. Can I grant my team members access to this software? Yes, using Orderhive you can add as many members as sub-users. You can also give limited or full access to your team. At a time how many orders can be handled by Orderhive order management software? Unlimited channels and unlimited orders! Does Orderhive order management software provide ‘Order-Hold’ functionality? You can add a particular order that you want to keep onhold using tags like “On-hold” or even set the due date. Can I link Orderhive with my company’s accounting system? Does Orderhive support POS and/or Brick & Mortar sales? Yes. Orderhive have Shopify POS and Vend POS integration. You can also create an offline store in Orderhive for brick and mortar store. Can I schedule the delivery of my particular order using Orderhive? It is a feature provided by shipping partners. However, you can use multiple options provided by shipping partners integrated with Orderhive, which will also help you fetch real-time rates for different services (i.e 1-2 day delivery). Can I customize purchase order, shipping, email or invoice templates in Orderhive? Yes, using Orderhive’s order management software you can customize ‘n’ numbers of templates for shipping labels, packing slips, purchase order, emails, invoices, and picklists. Can Orderhive charge my customer for orders? 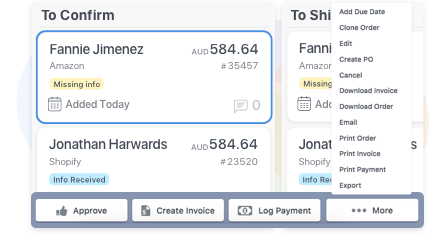 Yes, Orderhive order management software supports payment integrations with Paypal, Authorize.net and Stripe. It helps you create invoices to your customers. Does Orderhive support Seller Fulfilled Prime orders? Yes, Orderhive does support Seller Fulfilled Prime orders, an automated tag with 2-day delivery due-date can be created for those orders. Can Orderhive send non-FBA orders to FBA? Yes, with just one click Orderhive’s order management software can send a non-FBA order to FBA. You can add automation rules to send orders from select or all stores to Amazon FBA for fulfillment under its MCF program. Is it possible to add/save additional information to Orders? Yes, Orderhive order management software has a feature called Custom Fields, that can be used for Products, Sales Orders & Purchase Orders. There are 5 types of custom fields you can add in Orderhive: Text, Number, Dropdown, Checkbox, and Date. Thus you can distinguish orders or add specific information apart from limited default information that orders fetch from marketplaces. You can add as many custom fields depending on your requirement. Here’s how to add and use custom fields for orders. Why is it important to have an order management software in place? Retailing across multiple marketplaces like Amazon, eBay, your website or a brick & mortar store is not only tiresome but also prone to endless errors, owing to the lack of a proper order management system. This is true for a business of any size or scale. You are at constant risk of being penalized by marketplaces and losing customers for delivering wrong orders or for not delivering at all! From making your products available at the right place and the right time to fulfilling every order as promised is the key challenge. And this demands a set of processes to be followed and a holistic view of one’s business with real-time order records. How is Orderhive Order Management Software priced? Orderhive allows first-time users a 15-day free trial to help users get a hands-on experience on the look and feel of the software. After the trial period is over, users can select from 4 different pricing plans as per their requirements. Orderhive also offers customized enterprise solutions with complex and custom automation & integrations and higher security under its Orderhive Enterprise unit. What are the functional capabilities of Orderhive? Can Orderhive be integrated with other systems? Orderhive is a multi-channel order management software that supports integrations with leading shipping carriers like USPS, UPS, FedEx etc, marketplaces like Amazon, eBay, Bigcommerce etc, storefronts like Shopify, Magento etc, accounting software like Xero and Quickbooks, and all leading payment gateways. Any further integrations can also be added upon request by the user depending upon third-party conditions. For what kind of businesses can Orderhive be used? Orderhive is a user-friendly order management software. Business owners, manufacturers, retailers, wholesalers, entrepreneurs, e-commerce sellers, and brick-&-mortar store owners can use Orderhive to streamline their entire order management and fulfillment processes.